The international literature has thoroughly demonstrated the link between the speed of motor vehicles and the risk of collision and injury. Indeed, speed is a contributory factor in all cases of mortality and morbidity. A law of physics explains this situation: the transfer of energy absorbed by the body on impact is the sole cause of injuries. The amount of energy transferred increases exponentially with speed. In Québec, the burden on victims of road collisions accounts on average for roughly 700 deaths and 6 000 hospitalizations a year. Speeding appears to directly cause between 30% and 50% of fatal collisions and 25% of collisions causing serious injury. In terms of mortality alone, speeding would create a deficit equivalent to the annual number of births in two cities such as Rimouski and Drummondville. Speeding aggravates the adverse effects of pollutants in the environment generated by transportation. In the United States, airborne emissions of the main contaminants increased when driving speeds rose. Similarly, because it generates insecurity, speeding curtails walking and cycling, which are acknowledged to protect individuals against certain chronic diseases. Vehicles, road environments and legislation are factors that influence the speeds that drivers choose. Automobile manufacturers are allowed to produce, advertise and sell vehicles that can reach speeds well above speed limits. The construction of wide, straight, unencumbered roads encourages speeding. Less stringent legislation and less systematic enforcement of the law in terms of speeding compared to drinking and driving weaken the message that “Speed kills”. With so many incentives to break the law, the decision is left to drivers to comply with the speed limit, under threat of penalty. The speeds that drivers adopt stem from shared responsibility between the state, which adopts laws and regulations, the industry, and users. Under the injury prevention approach, priority measures rely on the effectiveness of interventions in preventing, limiting or mitigating the accumulation and transfer of energy. Because they are all geared to this objective, it is passive technical enhancements such as airbags, seatbelts, and bicycle and motorcycle helmets that have contributed the most to reducing the number of victims, according to the European Council for Transportation Safety. An examination of measures aimed at reducing speed and injuries leads us to the same conclusion regarding passive technical enhancements. The speed limiter is regarded as the most promising technology to reduce speed and the number of injuries once a sufficient number of vehicles are equipped with the device. Indeed, it would make other measures obsolete. However, as is true of any innovation, this innovation must be implemented gradually. It is anticipated that it could become compulsory in 10 to 15 years in England and Sweden. Its optimal effectiveness is due to its ability to reduce speed on the entire road network at all times once the device is installed on vehicles. The speed limiter is also credited with having a positive environmental impact through the anticipated reduction in gas consumption and pollutant emissions. Traffic calming measures, which are favourable to pedestrians and cyclists, encourage or compel drivers by means of physical obstacles or specific layouts to slow down. Such measures are widespread in Europe. The approach has had a less conclusive but positive impact on safety and speed reduction, when applied in urban areas. Traffic circles and speed bumps appear to be among the most effective targeted measures. Once installed, they require no reinforcement; that is, they are passive. Most importantly, however, all measures depend upon the speeds chosen as legal limits. Research in the United States and Europe has shown that increases in speed limits influence actual driving speeds and the toll of victims. Conversely, lowering legal speed limits has a positive effect on actual driving speeds and the number and rate of lives saved. Credible speed limits strongly encourage drivers to comply with them and, to this end, speed limits must be adapted to the environment and to all road users. Moreover, measures aimed at modifying behaviour have had limited impact. Promotional and awareness campaigns have a short-term effect when conducted in isolation. They neither broaden compliance with speed limits nor reduce the number of victims. For a long time, strong empirical evidence has shown the worrisome effects of driving courses and driver education programs among novice drivers. By encouraging young people to obtain their driver's licences sooner, courses and programs increase their exposure and therefore, their rate of involvement in collisions and their likelihood of being injured as a result. These measures must be excluded from a preventive strategy. As for the effectiveness of control measures such as police or automated surveillance, it is based on the perception of the risk of arrest. To modify driving speed and injuries, there must be sustained and intensive surveillance operations. Such programs are costly and their impact is limited over time and confined to the control sites. Photoradar heightens the perception of the risk of arrest because it detects numerous offenders around the clock. To be effective, the sites must be selected based on the danger associated with driving speeds. Otherwise, the measure is discredited because it is perceived as a tax designed to enrich the state. In any case, once the measure has been fully implemented, financial benefits lessen over time. Beyond specific measures for which conclusive data exists, a more general observation prevails: the countries that have achieved the greatest success in reducing the number of victims are those that give speeding the same priority as drinking and driving. Great Britain, Sweden, the Netherlands, Australia and other countries have adopted government safety policies that have reduced preventable mortality thresholds to the lowest levels. The policies promote technology as a means of achieving ambitious, realistic objectives. They also strike a new balance between safety and the imperatives of mobility. The human, social and economic costs of road injuries justify the choice of the measures most likely to reduce the number of victims and injuries linked to speeding. This is also the focal point of the Programme national de santé publique. the establishment of criteria governing the determination of speed limits on the road network. To protect the public at the lowest cost and on the basis of effectiveness, any close examination of the literature should target measures that apply to all vehicles at all times, i.e. passive measures. Physical traffic calming measures can be introduced in the medium term on an experimental basis. The introduction of speed limiters, which solve the problem at the source, can be considered in the medium and long term. In the short term, solutions aimed at motorists' behaviour must be adapted according to criteria that are acknowledged to enhance their effectiveness. The orientations that result from present knowledge are sufficiently clear to facilitate the best choices. Only a comprehensive perspective allows integration of public health objectives, sustainable development and safety for all users of the road network. This platform can serve as a basis for discussion between interveners who share responsibility for the problem and solutions for it. One second is the minimum time for a vigilant driver to react to an obstacle. Seventy-six metres is the total distance that a vehicle covers before stopping when the driver is travelling at 100 km/h on a dry road, and 165 m when the vehicle is going 130 km/h. Zero is the probability of survival when a pedestrian is struck by a vehicle travelling at 80 km/h. Every year, 708 deaths, on average, occur on Québec roads, equivalent to the passenger loads of two Boeing 747 aircraft or the total number of births recorded each year in Rimouski and Drummondville. The average annual number of days of hospitalization attributable to road collisions stands at 6 167. Speeding accounts for 30% to 50% of fatal collisions according to a number of experts in the world, which makes it as important a factor as drinking and driving, all the more so as most drivers exceed the speed limit. In Québec in 2001, 596 649 speeding tickets were issued, three-quarters of all infractions issued by the police. One driver in two or even two drivers out of three or three out of four fail to comply with the posted speed limit, depending on the type of road, in Québec. Some 95% of drivers deem their driving speeds to be safe. 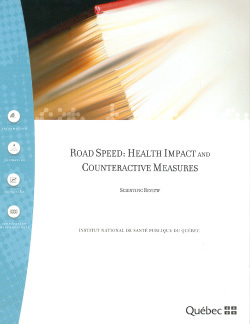 The perception among Québec drivers of the risk of being arrested for speeding is low. Over 50% of the vehicles manufactured and sold today can reach a maximum speed of 200 km/h. The laws of physics show that the transfer of energy sustained by the body in a collision is the sole cause of death and injury, and risk increases exponentially with speed. To demand that drivers alone curb the power of their vehicles without the help of technical devices such as the speed limiter to reduce preventable deaths would be equivalent to renouncing the use of a vaccine to combat an epidemic. This scourge afflicts both adults and youth in Québec society.